You won’t find any churchy clichés or perky platitudes here. Just an honest telling of a hard journey — hard in the way one wrestles with reconciling their theology with their reality. In a world constantly spinning and a culture constantly changing, we all need something unchanging to hold on to — something steadfast to anchor our souls amidst the swirling turmoil around us and within us. God’s Word is the only unchanging, eternal reality we can look to. Like the North Star pointing the way home for sailors who have no other fixed point to rely on, God’s Word shows us the way home. We don’t have to be graduate students in seminary to be serious students of the Bible either. God’s Word is just as much for the mom serving pizza to her kids in a living room as it is for the pastor serving on staff at a church. The Holy Spirit enables every believer, wherever we are, to understand the uncompromised truth and uncontested beauty of Scripture. When we hear God’s voice through the pages of His Word, we find our true home in Him, and the brokenness we experience in the deep waters of life is redeemed for a purpose greater than we can imagine. One word comes to mind when I think of Denise Hughes: Biblical. And the one word I’d use to describe this book? Timeless. It’s not trendy. Denise doesn’t color outside the lines in order to be cool. She loves God’s Word, knows God’s Word, and articulates God’s ways in a timeless, beautiful fashion. If you long to know God on a deep and profound level, Denise would tell you to spend time in His Word. Absolutely true. But I’d also say, take your time working through the pages of this book. Denise serves as a wise, godly mentor. She tackles tough questions and offers fresh insight, all at the same time. This book is a gift to God’s people. Do you want to open the Bible but don’t know where to begin? Or does the size and depth of God’s Word intimidate you? If these questions have crossed your mind, Deeper Waters is for you. Denise’s fresh look at God’s Word removes that intimidation factor. She gently leads you into the Bible and takes you on a perspective-changing, life-transforming journey through its pages. Her personal stories and creative teaching style, combined with her biblical depth, transform the Bible from a textbook to a workbook. Denise equips you with practical tools to read your Bible confidently; know God intimately; apply what you learn personally; and most importantly, take what you have learned into your corner of the world. 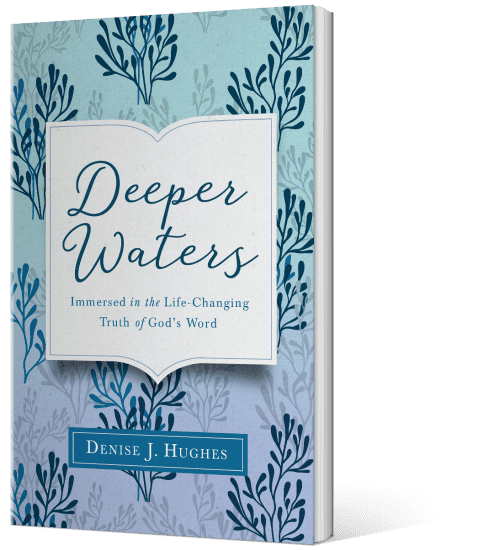 Reading Denise’s marvelous new book, Deeper Waters, makes me feel as if I’m sitting at the feet of a scribe whose gentle manner and profound wisdom stirs a fresh hunger in me to study God’s Word. Denise employs a nonthreatening, easy-to-understand method of study. Her gentle encouragement and practical wisdom are framed by deeply moving and transparent stories of her own life, hurts, doubts, and seasons of brokenness every woman can relate to. Nothing will transform your life more than hearing the voice of God. Let Denise take you by the hand and guide you on your journey and get ready to have your life transformed. In a world searching for purpose and meaning, Denise Hughes is a teacher of truth and a storyteller of beautiful redemption. She distills the details of Scripture with a voice that rings clear, revelatory, and applicable. Deeper Waters is a journey you don’t want to miss. From the opening pages of this beautiful book, you cannot miss Denise’s passion for God’s Word. Prepare your heart, because that passion is contagious. Dive into Deeper Waters and drench yourself in the saving grace, tremendous power, and redeeming love of God. This book is a treasure. Read this book with a Bible and box of tissues nearby. Part memoir and part Bible study, Denise’s book will touch your heart. Her beautifully chosen words will bring you closer to the God of all comfort.